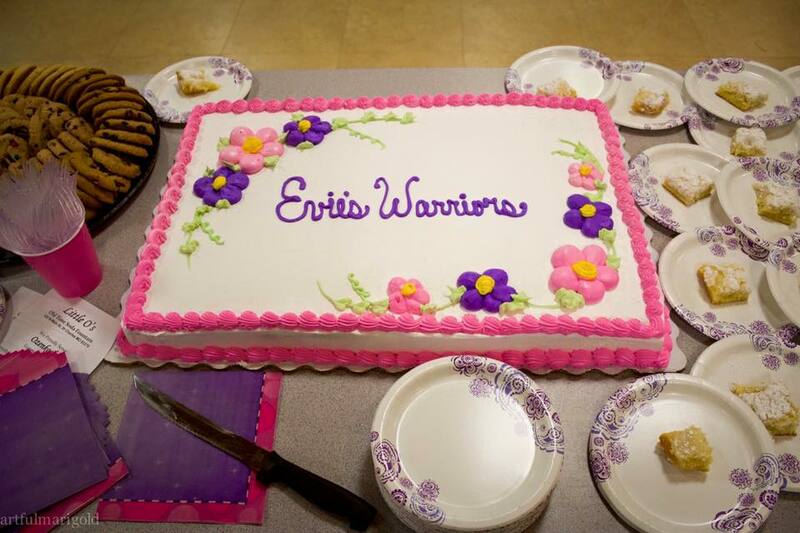 We had a blast and made so many memories at the 2nd Annual Evie’s Warriors Trivia Night! 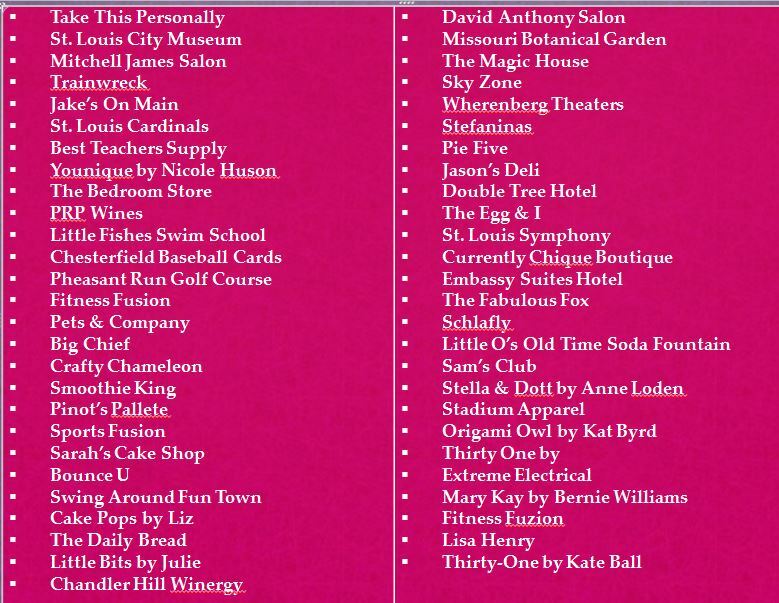 We have so many people to personally thank but we would like to start out by thanking our friends at KMOV Channel 4 for their love and support in helping us make this event such a huge success! 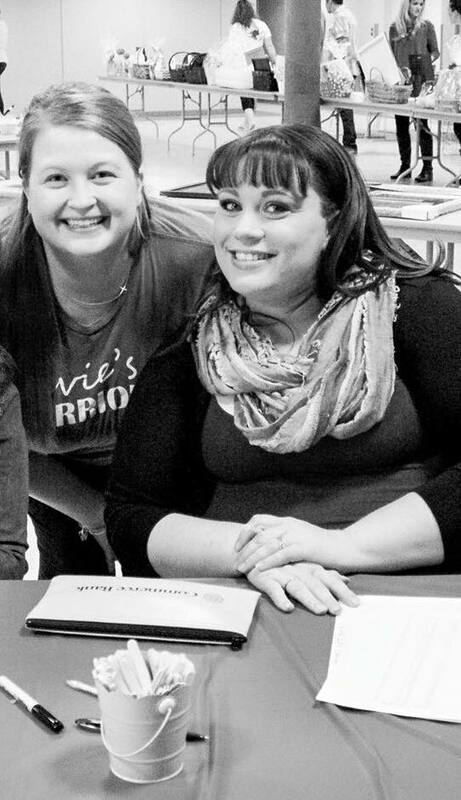 With the help of our wonderful emcees, Emily Rau and Mike Colombo, we raised over $7,000 to go towards Evie’s stem cell fund! This year definitely proved to be bigger and better. 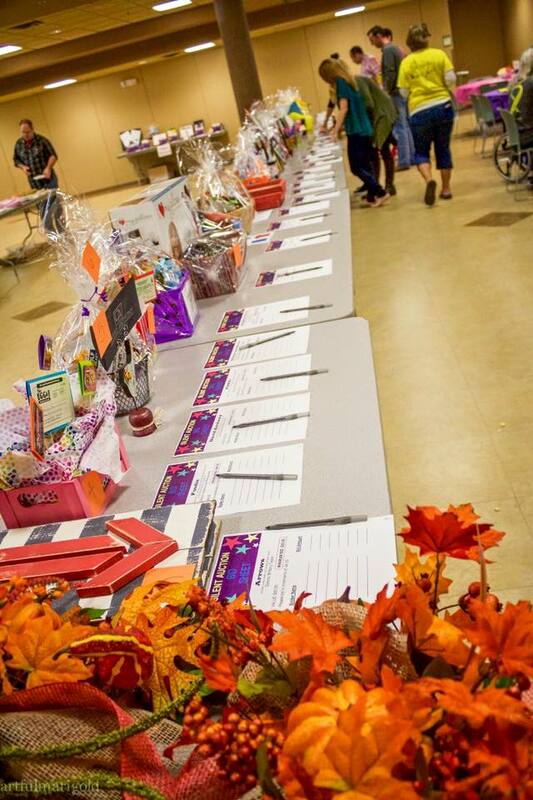 With more silent auction items to bid on, the addition of the raffle basket table and the amazing sports memorabilia, everyone found something they loved! 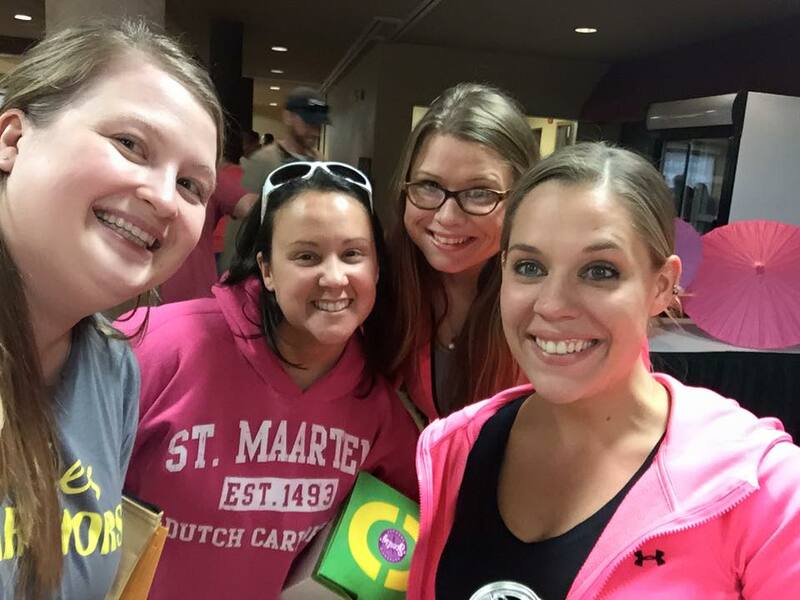 For the second year in a row the KMOV table won Trivia Night…looks like they will have a title to defend again next year! 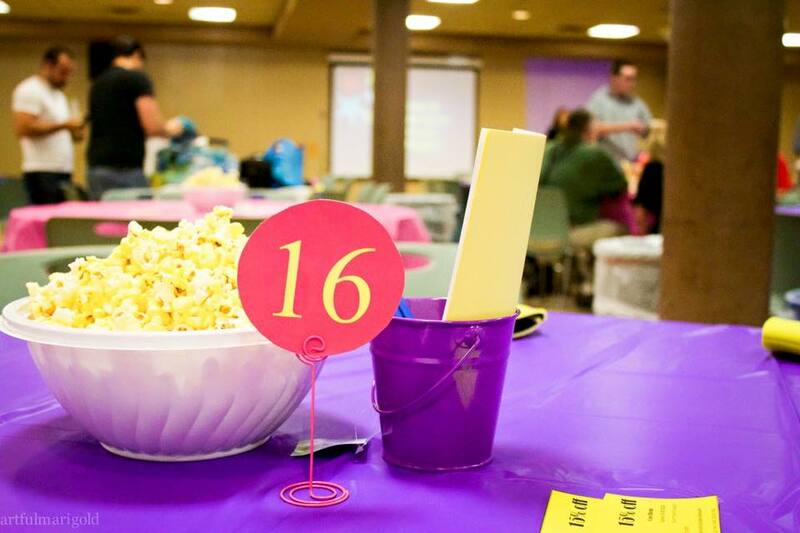 Before we share some of our favorite pictures from the evening we would just like to say THANK YOU to the many sponsors who contributed to making Trivia Night such a huge success! 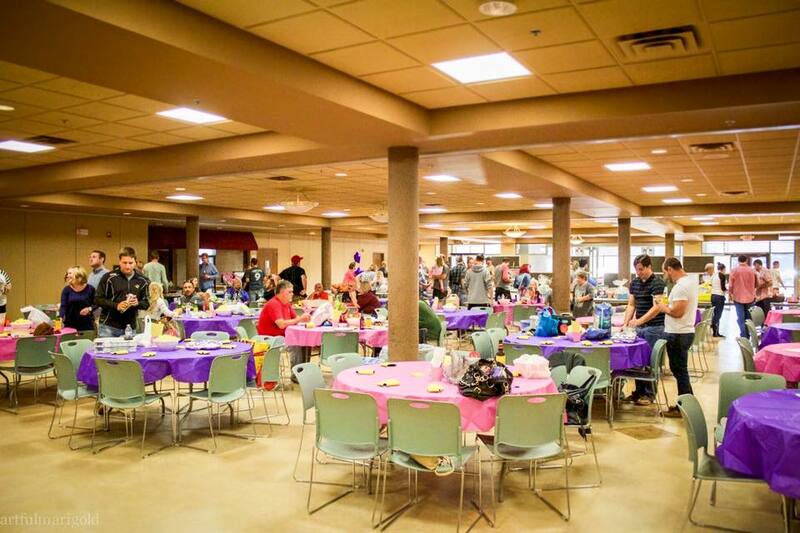 And now for what everyone truly wanted….a few of our favorite pictures from the evening! 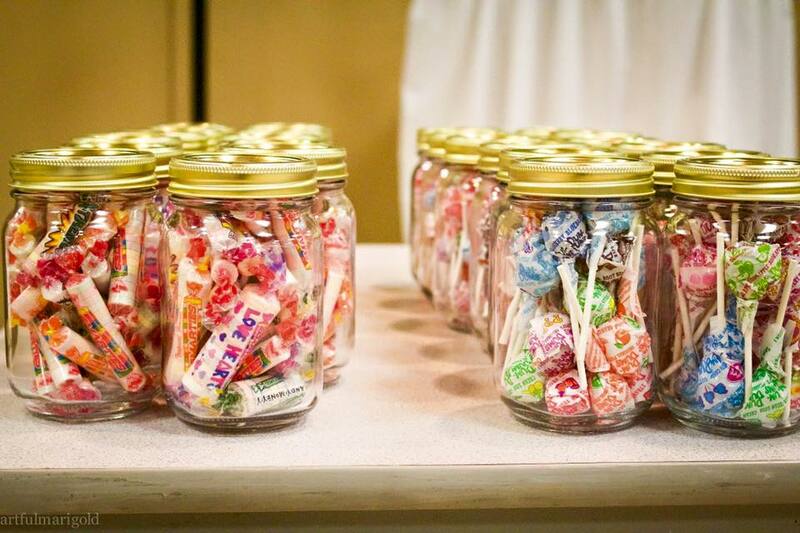 For the “smarties” and “dum dums” of each round! Heather (Evie’s mom) with friends from work, Jasmine, Jen and Emily. 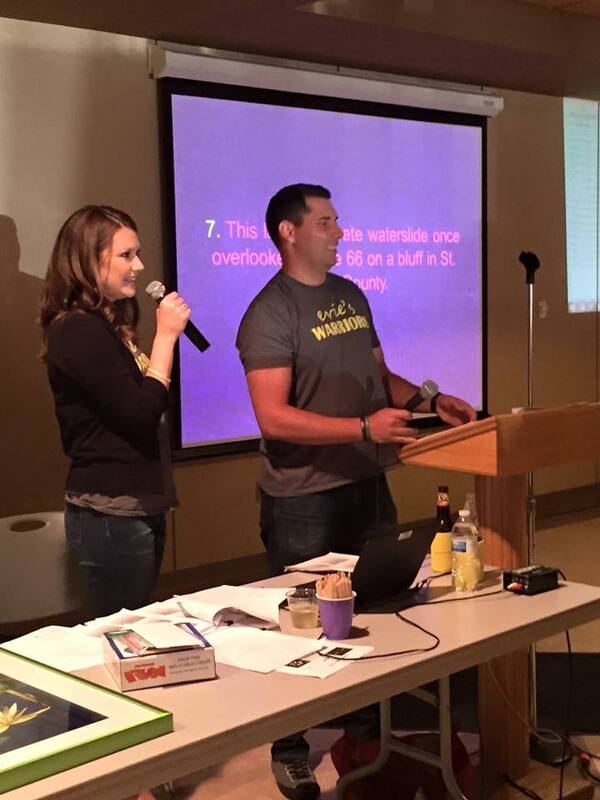 Mike and Emily working the crowd! 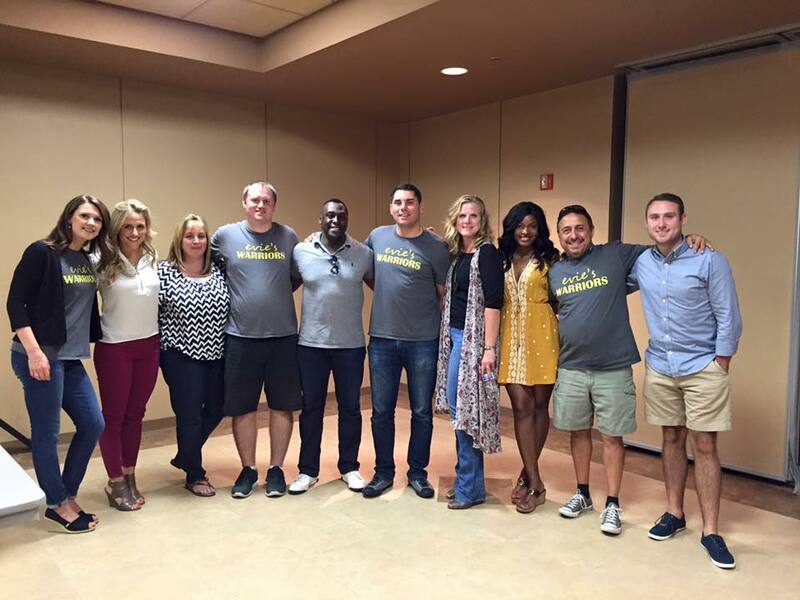 News 4 This Morning on-air talent and crew. 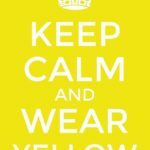 Thanks for all the love and support! We made some really great memories. 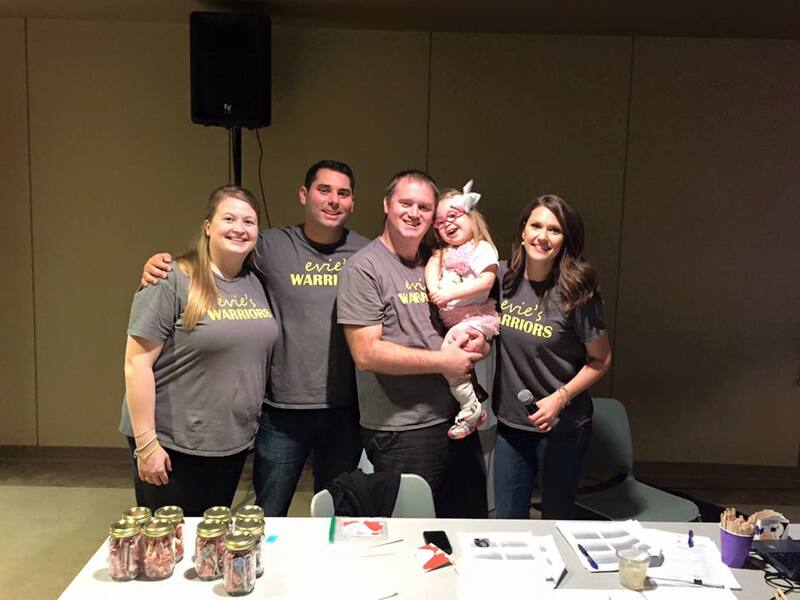 From Left to Right: Heather (Evie’s mom), Mike Colombo, Joe (Evie’s dad), Evie and Emily Rau. 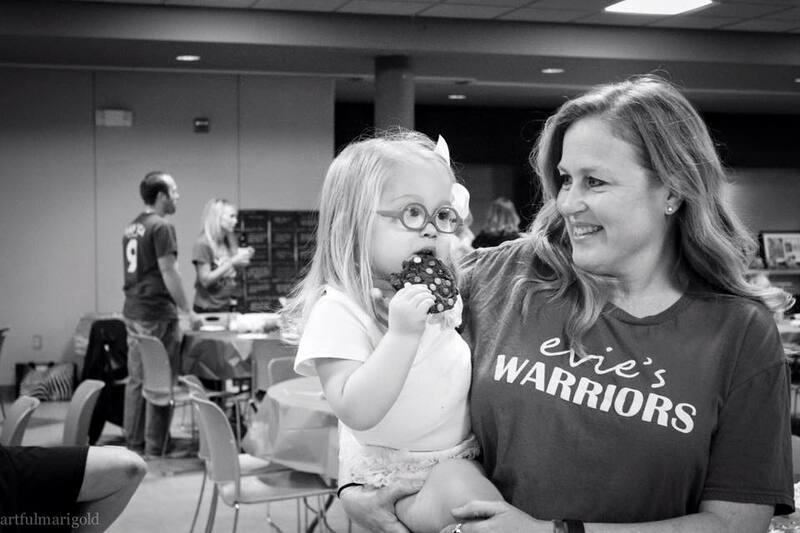 Heather with Jenny…you all will learn more about Jenny and her role with Evie’s Warriors in months to come! 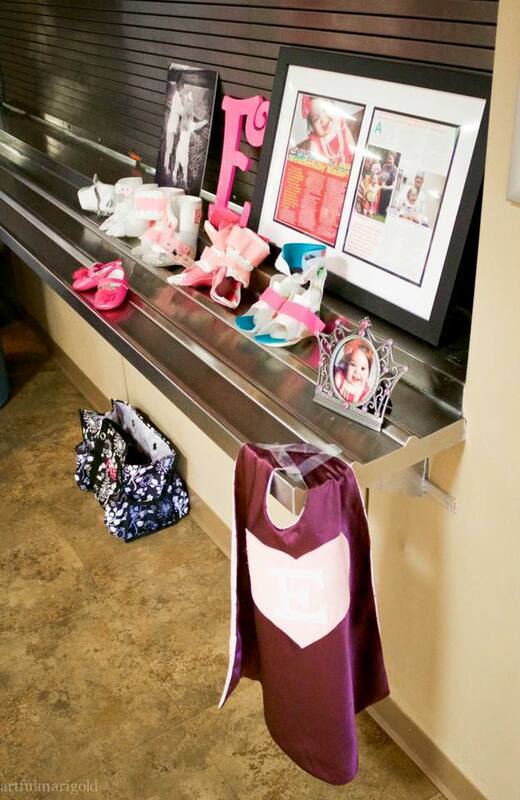 Evie memorabilia – all of her foot orthotics from 5 months old to current, Evie’s super hero cape, framed articles that appeared in Glennon Magazine and pictures of Evie. Evie with her Grandma Jenna. Beautiful cake and cookie tray donated by Sams Club Chesterfield and Gooey Butter Cake donated by Little O’s. 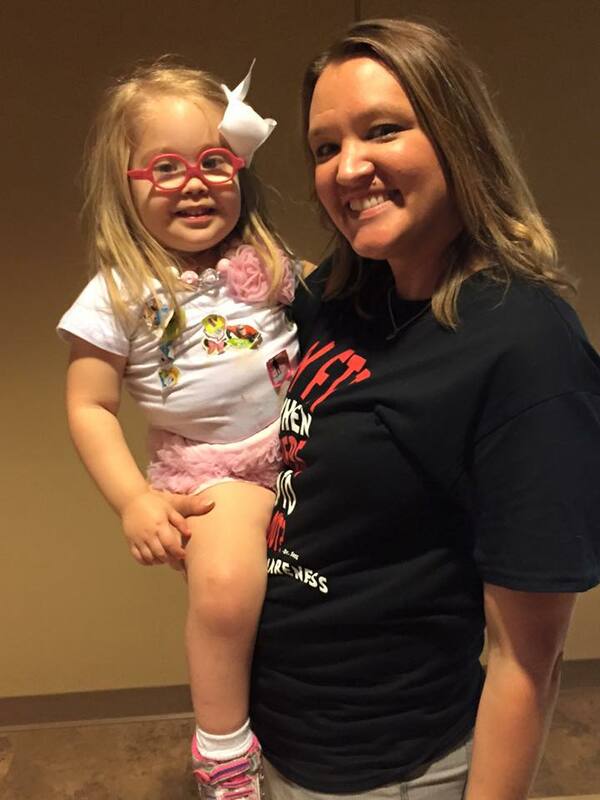 Evie with Ms. Shannon, Assistant Director at Evie’s school, Chesterfield Academy. 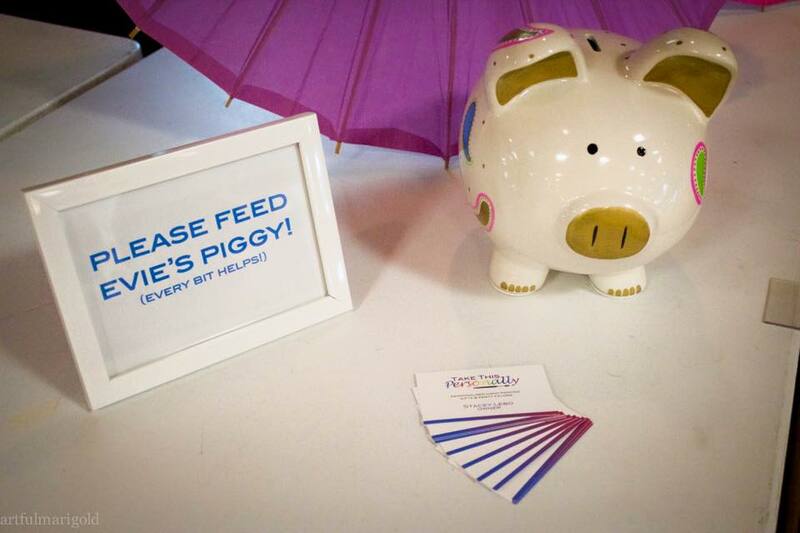 Evie’s gorgeous hand-painted piggy bank donated by Take This Personally. Pink and purple set-up for the princess! 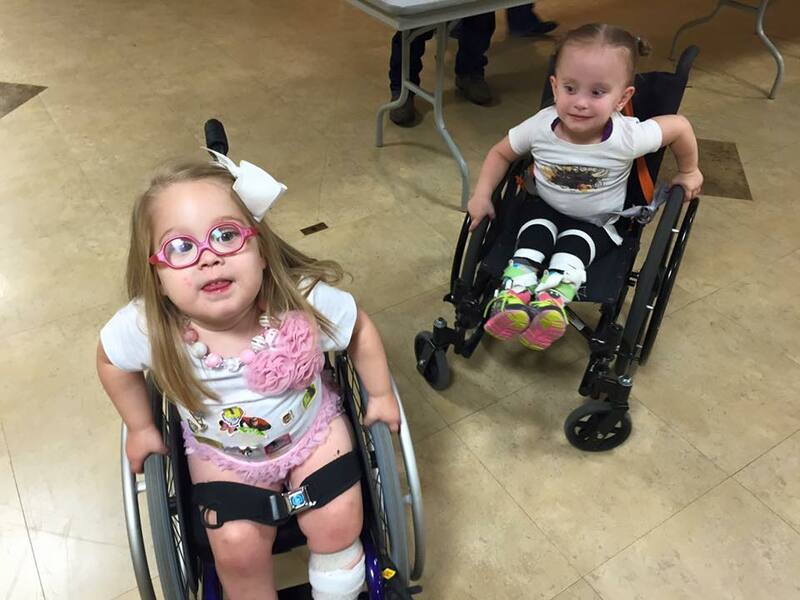 Evie having fun wheeling around with her friend Kaylee. 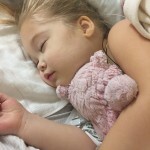 Kaylee is the daughter of one of our very good friends and she also has Spina Bifida, like Evie. 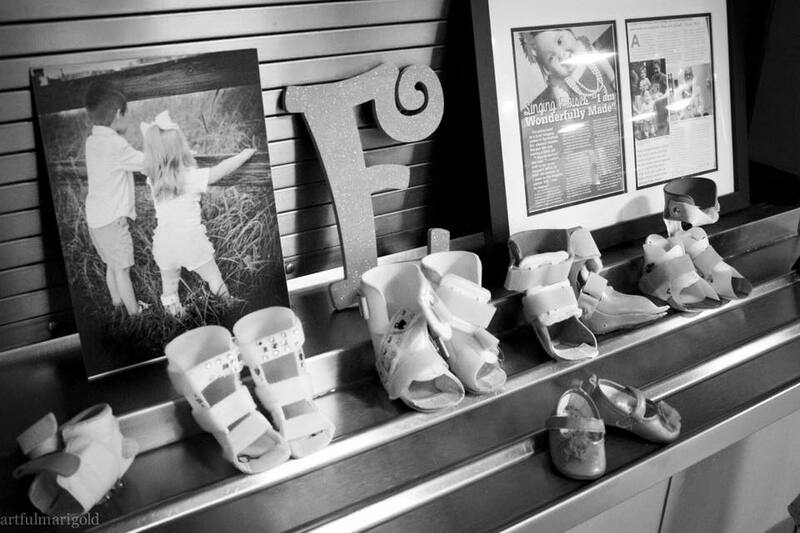 Close up of Evie’s orthotics. 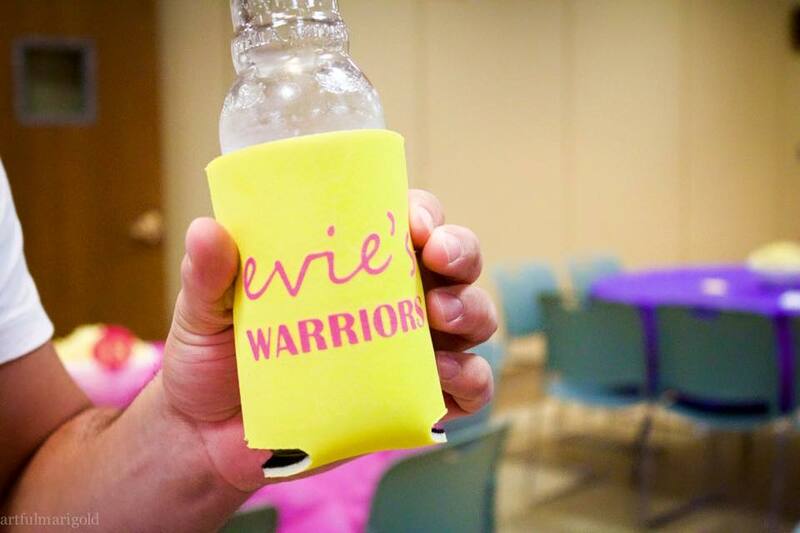 The can koozies were a hit!